Bob Bowker was talking about the appeal of holiday music recently, saying “it gives a sense of tradition. It also evokes memories, and almost all of them are good ones. Most people are familiar with so many of these songs, know the lyrics and like to sing them with other people. By doing that we are connecting to our own humanity”. That’s a fine thought, for any season. Bowker would know. He is an admired composer, conductor and record producer, and 15 years ago he brought together a couple of dozen of the area’s finest vocalists (classical, jazz and every genre in between) to form The Lakeside Singers. Though the group performs throughout the year, this is its busiest month. Their concerts are joyful, filled with smiles between singing strangers in the audiences, and a fine example of how music forms a charming backdrop for the holidays. He goes on to speak of other people and their remembrances. His closing line is “so, merry, happy and all that jazz”. I was delighted to receive the email about the holiday concert and am pleased that the Evanston performance is on a date that works for our schedule. I am planning to organize a Rotary group – they had rave reviews last year, so I know there will be a lot of interest. I wanted to tell you how much we enjoyed the performance in Evanston last night. Other than The Book of Mormon, I haven't had such a fun evening in a long time! ... What an amazing group of talented performers. I've never written a fan letter before but I guess this qualifies as one! I just wanted to let you know how much I appreciate the gift of music that you and the Lakeside Singers bring to me. The concert last night was superb. The selection of music, again, as at other performances, was so lovely. And, the group, both the ensemble and the soloists, and, the band (of course), brought such care, precision, and expression to the works. It was breathtaking and inspiring. I was particularly moved by the Zuni Sunrise Song. It's a wonder when feeling comes through and transcends language. 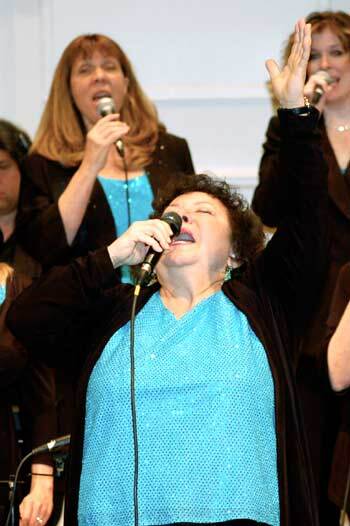 But, I guess I'm preachin' to the choir (Ha!) Additionally, I was thrilled to hear the young singers from Kelly High School. The confidence and recognition that these young people experienced (I met a few of the students during the intermission)is a treasure. Keep up the good work. I attended last night's Lakeside Singers show and wanted to thank you for an immensely amazing and completely satisfying musical experience. I took my 13 year old daughter, Katie, and she was in awe, just like her dad. It was a magical evening for both of us. Thank you so very much! I just want to say again what a tremendous joy it was to hear your wonderful concert last night! It's been a long time since I was so impressed with a choral group; the range of repertoire rendered so authentically was truly amazing. Every detail of musicality was in place and expressively delivered. What a consummate musician you are. And thank you so much for programming Orpheus and singing it so beautifully. I couldn't ask for a better performance! Can't wait til next season to hear more of your group. 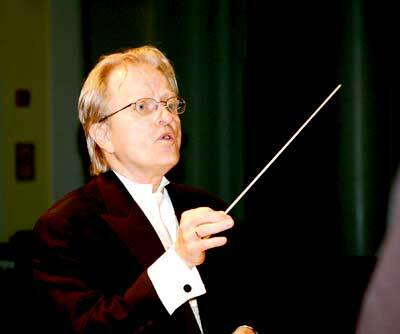 Robert Bowker is Founder and Conductor of the Lakeside Singershe Lakeside Singers. He is also the founder, assembling the group about ten years ago. 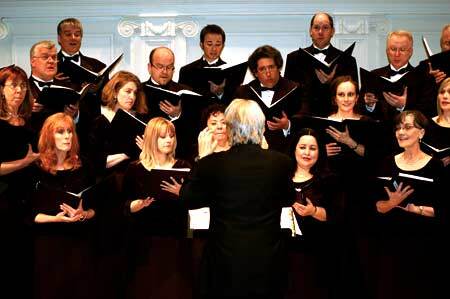 The group is fairly small – just twenty-four professional singers – but they have a wide range of musical proclivities. Most of his singers have degrees in musical performance, and most are earning their livings with music. Having seen four of the Lakeside Singers’ concerts now, I imagine that Mr. Bowker put this group together to see how far he could push the musical envelope with the right talent and how much fun they could have in the process. Not only can they perform brilliantly, but they can poke fun at all types of music in the process while keeping straight faces. 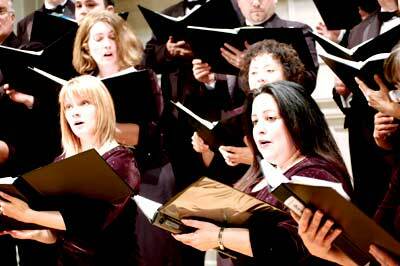 Many of the singers are also talented instrumentalists, and switch roles throughout the concerts. The first half of Lakeside concerts are traditionally more serious, and the April concerts were no exception. At least they seem to begin more seriously, what with the tuxedos and long black skirts. But you just never know what you’re going to get, and that’s the joy of it. The first song was Morning by Hungarian composer GyorgyLigeti, and part of the 2001 Space Odyssey soundtrack. The Singers returned to the stage after intermission wearing their sparkle clothes, and the music moved in the direction of Pop. 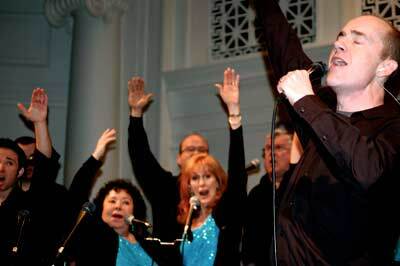 Andrew Distel and Sherry Robillardsang Where is Love from the stage play Oliver! as a beautifully romantic duet. Dan MacDonald was the theatrical featured soloist for Sit Down You’re Rocking the Boat. Country was represented by Lisa Bowker and Melissa Smithson singing Little Big Town’s hit Boondocks. And the Lakeside Singers showed that they were equal opportunity fun-pokers for Pop music too with the Title of the Song from Da Vinci’s Notebook. No Lakeside Singers concerts would be complete without a Josie Falbosoulful solo, and her selection was You Pulled Me Through, by Diane Warren. 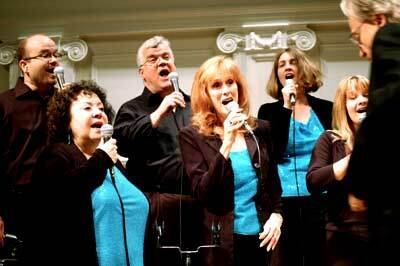 Upcoming performances of the Lakeside Singers include a July 23, 2010 8 PM appearance at the Ravinia Festival. December concerts will be held at several Chicagoland locations on December 3, 4, 6, 17, and 20. More information is available at http://www.lakesidesingers.com. The Lakeside Singers is an essential part of our holiday tradition and it’s a habit I have no intention of breaking anytime soon. I can’t think of a better way to get into the holiday spirit and stay there for the duration and beyond. Like a delicious taste or fragrance, it lingers, and brings back warm memories. As always, at “In the Frosty Air”, this year’s holiday concert, we enjoyed their trademark jolly, joyous concert voices in two well-defined "acts" that even include a costume change to make sure we get it. "Act I:" Off to a quiet classical start. The classical first half featured music of Bach and Lauridsen and carols from around the world. Bring your jangled nerves, frazzled schedule and holiday jitters and feel them melt away as you listen to the “Gloria from the Bach Mass in G minor,” familiar carols and quaint, quirky, quietly profound music from Germany, Spain, England, Mexico and France. Add to that the most ingenious musical prank I’ve ever seen in a concert and that pretty much summarizes what I call the celestial portion of this program. During the intermission, prepare yourself for a complete change of pace. The tunes were made famous by Koko Taylor, Bette Midler, Gene Puerling, Celine Dion and N&rsquo;Sync. 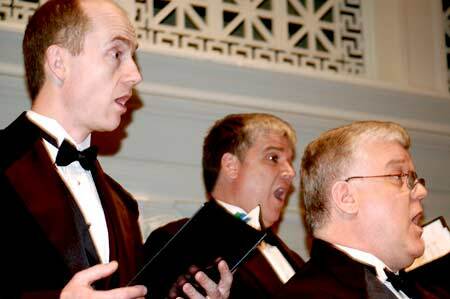 The Lakeside Singers&rsquo; authoritative interpretation revived, refreshed and reinterpreted them. Its incredible band (often assisted by versatile singer/instrumentalists) added deft finishing touches that were bold, brassy and brilliant. Jon Negus played four different instruments and sang a knockout solo. ...And then everybody gets into the "Act"
The concert "winds down" with the popular sing-along followed by the bring-the-house-down-gospel stylings of Josie Falbo. What a finish!